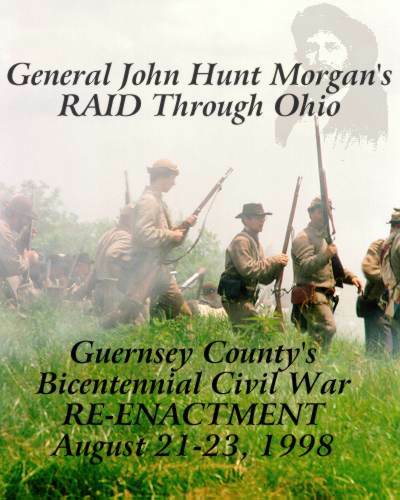 On July 13, 1863, John Hunt Morgan's Confederate Cavalry began a daring raid through the State of Ohio that lasted for nearly two weeks. Morgan's men entered the state near Cincinnati and ravaged a large number of farms and properties while eluding capture and traveling east through southern Ohio. Union pursers under Brigadier General Edward Hobson chased Morgan to the Ohio River near Bufffington Island where additional Union troops under General Kautz and Judah lay in wait. Morgan and his men tried to ford the Ohio River near Buffington Island on July 19. While crossing, they were attacked by Union Gun boats and infantry forces. Although some of the men made the crossing safely, Morgan and several comrades were forced to retreat from the Ohio shore. This Southern Chameleon and nearly 400 of his men escaped the attack leaving 700 of their own men as prisoners of war and over 100 dead or wounded.